Completed projects receive more public attention than the process of their creation and so the myth that architects design buildings alone lives on. In fact, architects work with a great many others and the relationships that develop, particularly with clients, have a significant impact on design. Design through Dialogue explores the relationship between client and architect through the lens of four overlapping activities that occur during any project: relating, talking, exploring and transforming. Cases of design and collaboration range from smaller scale retail, residential and educational projects in the US, Sweden, the UK and the Pacific Rim to large institutions, including Seattle’s Central Library, the National Museum of the American Indian in Washington DC, the Supreme Court in Jerusalem and the Museum of New Zealand. Material is taken from interviews with clients and architects and research in psychotherapy, group dynamics and design studies. Throughout the book aspects of process are linked to design outcomes to illustrate how architects and clients collaborate creatively. 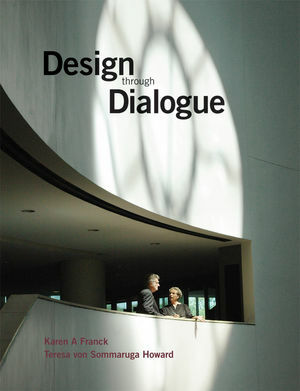 Karen A. Franck is a professor in the College of Architecture and Design and the College of Science and Liberal Arts at the New Jersey Institute of Technology. Previous books include Architecture from the Inside Out written with Bianca Lepori and Loose Space edited with Quentin Stevens. Teresa von Sommaruga Howard is a practising architect, an organizational consultant and a group analytic psychotherapist with a specialty in conducting dialogue groups. She lectures and writes about the dynamics of large groups, culture and change and involving people in the design of their environments.